Daniel Villegas after he was freed on bond in El Paso, Texas. A Texas man imprisoned for half his life for a double homicide that he, witnesses, and hundreds of supporters all maintain he did not commit was freed Tuesday, nearly two decades after he was sent to prison. Daniel Villegas, 37, of El Paso, has been behind bars since 1995, when a jury convicted him of killing two teenagers and sentenced him to a life prison term. His conviction was largely based on a confession that Villegas, just 16 at the time of the 1993 drive-by shooting in northeast El Paso, has said was coerced by detectives. On Tuesday morning, District Court Judge Sam Medrano set bond at $50,000 for Villegas. He was released about an hour after the hearing ended. 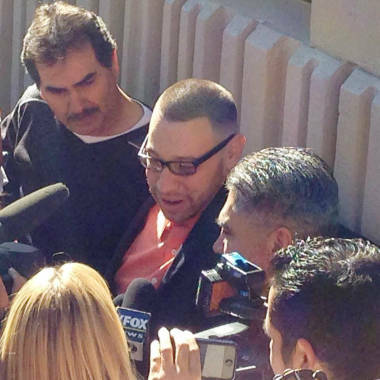 "I never thought this day would come," Villegas said after walking out of prison, reported The El Paso Times. The District Attorney's office has not yet announced whether it will seek a new trial for Villegas, and has until a Jan. 21 hearing to decide. Joshua Tepfer, one of Villegas' attorneys and co-director of Northwestern University Law School's Center on Wrongful Convictions of Youth, said Villegas went to church after leaving prison, and then was celebrating with family and friends. "He seems pretty relaxed, all things considering. I think he's been very prepared for this day," Tepfer said. "He's really happy." The confession that landed Villegas in a life sentence had numerous discrepancies in it: For example, Villegas claimed he was riding in a white car the night of the crime, when the vehicle involved in the shooting was actually red, The Los Angeles Times reported. Villegas quickly recanted, explaining he only confessed because he was told if he didn't, he would be raped in county jail and that he would get the death penalty. But his confession to the murders of Robert England, 18, and Armando Lazo, 17, was kept on file. An appellate court vacated the conviction in December. On Monday, District Judge Sam Medrano set Tuesday's bond hearing for Villegas. Jesse Hernandez, a witness to the double killing, told FoxNews.com in 2012 he did not believe Villegas was the shooter. "I believe with all my heart he is innocent," Hernandez said. "I always thought I knew who else might have done it from the beginning. I had never heard of Daniel before." Hernandez and another witness, Juan Carlos Medina, have both signed affidavits affirming Villegas' confession paints a different version of what happened the night of the shooting. Villegas' case attracted the support of The Innocence Project, Northwestern University Law School's Center on Wrongful Convictions of Youth, and Proclaim Justice, along with John Mimbela, an El Paso businessman-turned-activist who spent more than $200,000 trying to win freedom for Villegas, according to Proclaim Justice. Villegas also collected hundreds of other supporters throughout his years in prison who fiercely believed the lack of physical evidence tying Villegas to the crime should have more weight than his confession. According to Paul Cates, communications director for The Innocence Project, "young people and people with mental disabilities are more susceptible to false confessions." Mimbela, who dedicated himself to the case for seven years, created a website for Villegas, called QuestforJustice.net. The website says that Villegas, a high school dropout who read and wrote at a third-grade level at the time of his arrest, has had "many sleepless nights worrying and wondering" if he'll ever be free. Mimbela could not immediately be reached for comment on Tuesday, but on Monday, he told KFOX 14 in Texas, "Daniel and his family have been waiting for this day for over 18 years. So we are very excited that it's finally going to happen." Villegas' first trial ended in a mistrial, but his second trial, just three days long, finished with a swift conviction. An appellate court ruled recently that he did not have adequate counsel during the trial.